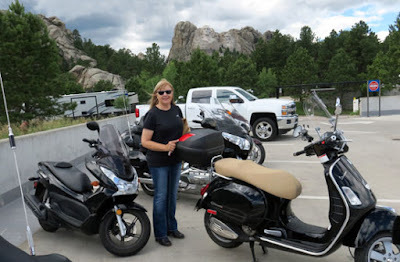 We took the scoots from the RV resort where we're staying via twisty back roads to Mt Rushmore. 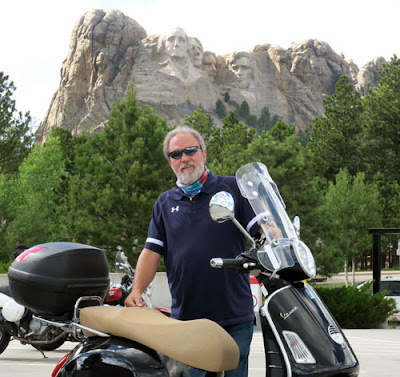 Gorgeous day, great roads, a nice meal with a close-up view of the Memorial, fun ride back. Looks like a great trip. 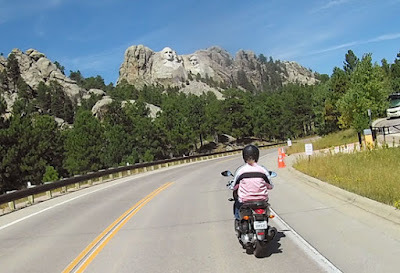 Been to Rushmore and the Black Hills a couple of times. What a great part of the country. Glad to see you're able to enjoy it. 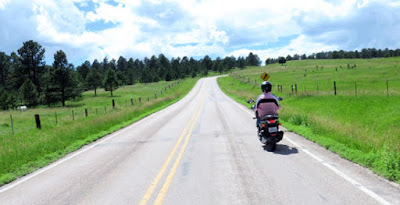 We lived in the northern Black Hills for a couple decades, so we know where the good-riding roads are! 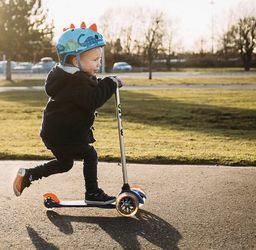 This is my favorite place to ride and our reason for spending the better part of the summer here. 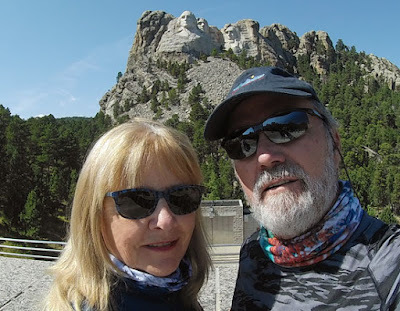 Being geezers, our parking permits for Mt Rushmore were only $5 per bike (usually $10) - makes it worth it to just bop up there for breakfast with the Presidents when we feel like it. 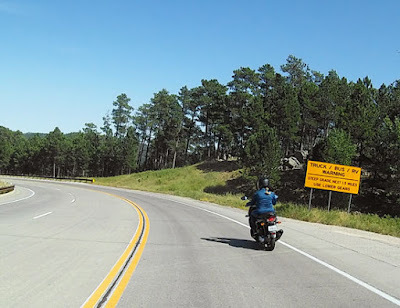 The roads get clogged up during the Sturgis Rally, but the rest of the time it is pretty mellow with the traffic... well, once you're off a main tourist road like Hwy 16. How's ol' Crazy Horse comin' along? Great stuff Cap't! Thanks for sharing. That a beautiful part of the world, enjoy yout stay. Thanks for the report. When I was last there that parking permit was good for a whole year, but I only needed to see it once a year. 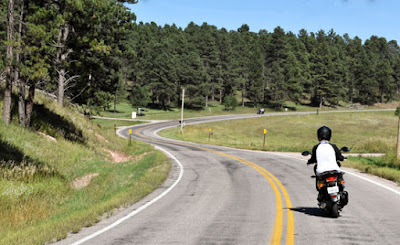 Our time here in the Black Hills is getting short - more fun riding in the southern Black Hills today. And, yes, a stop again at Mt Rushmore. 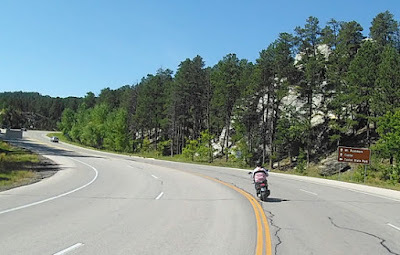 A couple laps of Iron Mountain Road. 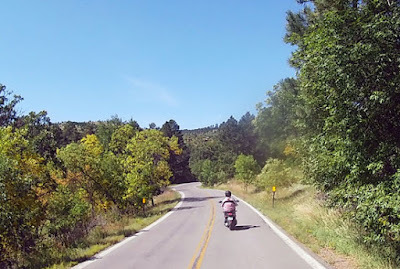 Cruising through Custer State Park. Perfect early fall weather. 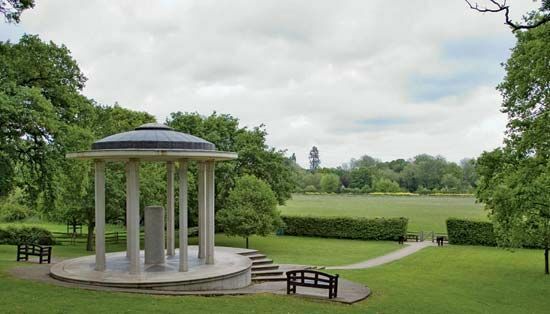 Shrine to great people that had power and gave it to the next elected president to maintain democracy. ...and I thought you had been here? My favorite place near Mt. 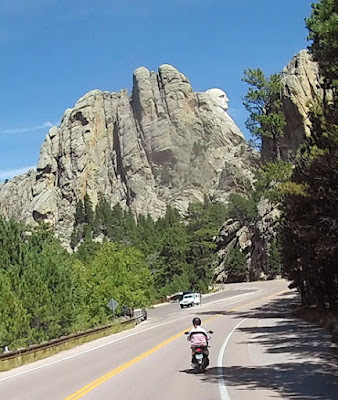 Rushmore is Custer State Park, just south. We rode the loop road and had to stop for 200 Bison crossing the road. 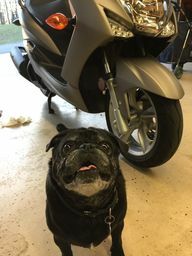 In a car you're isolated, but on a bike, you're out there with the big animals. The lodges had fabulous food, not like the National Parks vendors. UPDATE: Oops, I see you've covered Custer State Park in other posts. Sorry!I will check those blogs and wish I was there. 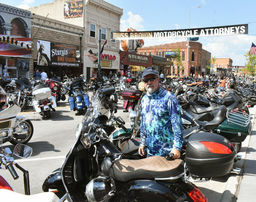 Are the roads normally that uncrowded when Sturgis is not happening? 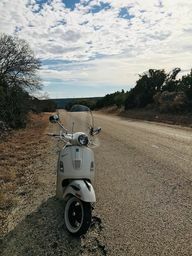 Is there a sweet spot date for good temps and uncrowded roads?